After suffering the worst sales decline in nearly 60 years in 2007, American newspapers could be heading to an even deeper drop in 2008, based on the industry's performance in the early months of this year. If sales continue deteriorating at the same dismaying rate for the balance of the year, the resulting revenue crisis will threaten the economic viability of the financially weakest and most debt-ridden newspapers – and the journalistic mission of nearly all of them. Slammed by the unprecedented collapse of every major advertising category, American newspapers in 2007 recorded their worst sales decline in modern history, as print revenues fell 9.4% to $42.2 billion (vs. a forecast here last fall of $42.7 billion). Apart from the 9% plunge in print sales in 2001 after the twin calamities of the tech bust and the terror attacks, there has been no other annual sales decline approaching this magnitude since 1950, according to the records kept by the Newspaper Association of America. Because NAA’s published data only go back to 1950, there’s no telling when, or if, sales ever dropped more than 9.4% in a single year. Grim as it is, last year’s record may not stand for long, if the industry cannot reverse the queasy sales decline it experienced in the first two months of 2008. While many publishers have stopped reporting their monthly sales, those who still provide the information posted far worse performance in the opening months of 2008 than they did a year ago. 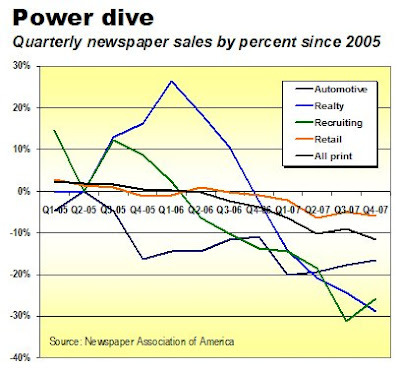 Back in 2007, the industry reported a 6.4% decline in total print sales in the first three months of the year. The best sales performance in the first two months of this year among the reporting publishers was an 8.8% drop at Gannett. The worst performance was a 16.8% plunge at McClatchy. In other words, the sales declines for the two publishers were respectively 1.4 times and 2.6 times deeper in the first two months of this year than the industry experienced in the first quarter of 2007. And the first quarter of last year was, gulp, the best. Sales fell 10.2% in the second quarter, slid 9.0% in the third period and dropped 11.6% in the final three months of 2007. It’s not possible to forecast sales for the balance of this year for two reasons. First, the economy is too unsettled to predict how the next nine months will unfold. Second, newspaper sales have been in distinctly uncharted and hostile territory since 2005, when all the major advertising categories began a downward trajectory they have been unable to reverse. Wth no precedent to draw on, there's no way to guess how low they might go. Every print category ended 2007 lower than it began. Retail fell 5.0% for the year to $21 billion, auto classified skidded 18.3% to a bit less than $3.3 billion, recruitment slid 19.8% to $3.8 billion and real estate – the lone bright spot before the housing bubble popped – plunged by 22.6% to $3.8 billion. Each of these categories continued eroding in the early months of 2008. The one comparatively bright spot for newspapers in 2007 was a brisk 18.8% increase in online revenues to just short of $3.2 billion. But even this advance fell well below the 31.5% annual interactive gain that cheered the industry in each of the two prior years. Despite the repeated promises of publishers to recast their struggling franchises as signficiant online entitites, last year’s interactive revenues amounted to no more than 7% of total newspaper industry sales. This meager performance was achieved in spite of the fact that print sales, which represent the vast bulk of the denominator in this ratio, fell by 9.4%. Further, the 18.8% jump in online revenues at newspapers was only three-quarters of the size of the 25% annual sales increase that powered over-all online sales to a record $21.2 billion in 2007. So, newspapers are trailing considerably in online market share at the same time their traditional print advertising business is melting down. With the contraction in newspaper advertising apparently accelerating for the third year in a row, publishers would be hard pressed in even a robust economy to reverse the trend. But these are far from the best of times. Continued shocks and uncertainty have created one of the worst, if not the worst, business climates since World War II. Even Alan Greenspan, whose misfeasance helped put us where we are today, says so. Absent a turnaround that seems beyond immediate prospect, the depressingly inescapable conclusion is that the economic crisis for newspapers will continue to mount as their sales limp to ever-lower lows. Alan, unfortunately, you've once again summed up powerfully and coherently just how screwed the newspaper business is. I left the Star Tribune a year ago but remain keenly interested in what's happening to the business I worked in for 20+ years. It's a terrible thing to watch unfolding. I'm like someone who grew up in one of those once-thriving prairie towns, now living in the big city, who has to stand by and watch from a distance as the old hometown dries up and blows away. I cant wait until all the left wing newspapers in this country dry up and blow away!